The experts at IDC expect that more than 85% of organizations will have a multicloud architecture by 2018. In order to balance these clouds and ensure they are running at peak efficiency, you are going to need a cloud management platform. 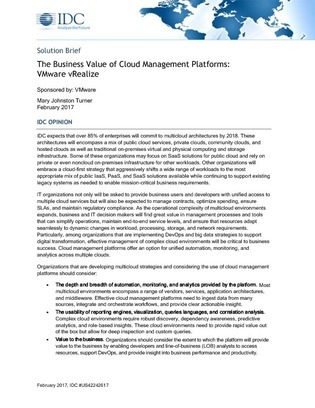 This IDC white paper takes a look at the business value you can expect to realize from a cloud management platform and breaks down one vendor's offering--enabling you to apply their evaluation methodology to other vendors on the market.